Now that I have all the basic, and some not-so-basic, pieces ordered, I’ll take a look at the modules I’ve bought and explain why I bought these, specifically. The biggest challenge in putting one of these things together is that shops that sell modular synth bits are few and far between. There’s nowhere to really audition different pieces of gear. If you’re fortunate enough to have a friend or two that have some gear, that’s great, but unless you want to buy just what they have, you still have some work to do. This VCO has all your standard waves (sine, triangle, saw, square/PWM), and from all accounts it is completely top-shelf on each of those. What it also has is a really cool Morph feature, which can morph the sound from a sine to either a square or sawtooth wave. The morph is also voltage controlled…which brings me to another thing. Almost everything on this VCO can be controlled via voltage, meaning you can have the entire VCO change over time. 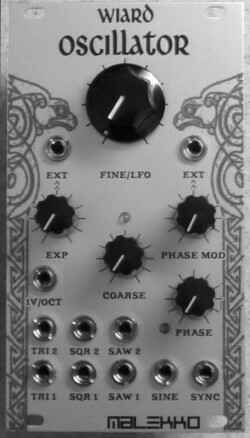 In reality, the morph is just a style of crossfade between a couple of the output signals. If you have an external crossfade module, you can do the same thing, but here it’s built in, so no need for another mixer. The other thing I’d say is to keep your eye out for FM, which this has. FM allows another oscillator to affect the waves in this module. This type of synthesis is what made the DX-7 so awesome (even though it was digital). Most folks just say Malekko, but that just doesn’t have the great ring of Malekko Heavy Industry. Anyway, this oscillator is interesting because, in addition to allowing almost complete control via voltage, it adds the interesting notion of phase shifting right in the oscillator. On the main outputs you have the original signal. On the secondary outputs, you have the phase shifted signal. When you put these two signals together, you get a whole bunch of wonderfulness. When you start modulating the phase, it really gets swirly. There’s a hidden gem in this one, too. It has a push/pull knob. That alone is cool, but what it does is even cooler. It turns the oscillator into an LFO…with phase shifting!!! So you can use any of the outputs to modulate other things altogether. And since you can control the phase shift via CV, you can affect all sorts of changes across your synth. SUHWEEET!!! When I emailed Shawn Cleary at Analogue Haven, I was putting together my order for the stuff I couldn’t find on eBay. I mentioned that I was considering the Z3000 from TipTop (a fine oscillator, itself), but since I was a noob, would he recommend anything else. He replied with this. So, after a little looking around and hearing/reading everyone rave about this module, I added it to the order. I don’t really want to walk down the feature list (you can do that here), but it’s made of all kinds of awesome. What’s really interesting about this guy is that in addition to all the standard stuff, it can be turned into an LFO, it has a -1 or -2 sub-octave, and some of the coolest FM circuitry around. The downside, this thing isn’t cheap. 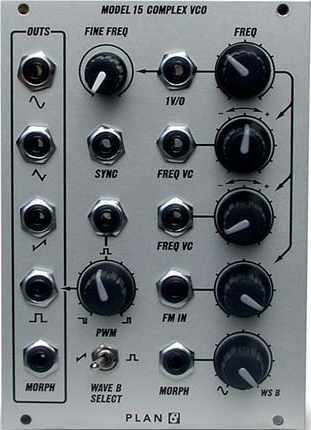 It’s around $400 for just this module. By comparison, most other oscillators that I was looking at were in the $210-$250 range. So here’s what I was shooting for: I wanted to get an extremely flexible set of oscillators that could give me loads of different sounds to mix and match. That gives me a much more solid foundation on which to build the rest of this synth. I just wish everything would get here so I can plug it all together! Up next, filters and envelope generators. Stay tuned…. I particularly appreciate the reminder about phase modulation – what a great sound. It’s interesting to see frequency modulation broken out from frequency control (at least in the first osc). Back in my ARP 2500 days, I had a friend who used to modulate the frequency of one oscillator with the output of another, which produced a primitive form of FM – I suppose in this case you can control the center pitch of the osc (say from the keyboard), and then modulate with a less severe mod signal. Interesting stuff!